You Were Never Really Here begins in a haze of vague, unconnected images – a murky body of water, a face suffocating through a plastic bag, a girl’s photo burning into a crippled contortion – all while a voice countdowns in whispers. Questions consume the viewer. Where are we? What is unfolding? Whose voice is that, a man’s or maybe a child’s? The fragments start to connect as the location reveals itself as a hotel room, but still we remain deprived of that vital establishing shot. Instead, a series of deliberately obscure close-ups show a bedraggled figure cleaning a bloody hammer, flushing the clots of red down the toilet, and chucking an array of items into a bin liner, including cable ties and gagger tape. We’re soon given the luxury of confirmation this is indeed Joaquin Phoenix, but beyond that the details remain sketchy right down to his payphone call to a voicemail and the simple message “it’s done”. What, why, where, when, who. Forget it. Scottish director Lynne Ramsey stands steadfast in her convictions, refusing to bow to convention or comprise her vision, resulting in a film that’s a masterclass in purely cinematic storytelling. Adapted from Jonathan Ames’ novella of the same name, ostensibly You Were Never Really Here is a revenge thriller in the mould of Taken, John Wick and Man on Fire. Many would name Martin Scorsese’s Taxi Driver as its most pertinent cinematic cousin, with both films concerned with the psychological depravity of their protagonists, while, more incidentally than anything else, they both follow men in search of redemption through lost girls. Though the similarities are there, it is actually John Boorman’s Point Blank starring Lee Marvin that shares a similarly innovative, nihilistic and fragmented spin on the revenge thriller. Even a comparison with Point Blank, which is quite a compliment, feels cheap and reductive when trying to articulate the nature of You Were Never Really Here. Frankly, it is its own dark, daunting and unruly beast. Through glimpses of his routine, involving seedy hotel rooms, clandestine meetings and sinister appropriations of DIY tools, we deduce Joe (Joaquin Phoenix) is an urban mercenary, muscle hired to do the unsavoury for New York’s elite. Joe operates somewhere between detached efficiency and simmering, uncontrollable rage, epitomised by his reply to client Senator Albert Votto’s (Alex Manette) question “are you brutal?”. “I can be” is Joe’s guarded response. Between jobs, Joe indulges his tender side by caring for his frail mother (Judith Roberts) in their childhood home – darkly and comically introduced to us via the backdrop of Psycho on the television. In a move typically of Ramsey’s approach, Joe’s cyclical life is visualised when he mops up after his mother, shuffling a towel between his feet in circles round the bathroom. Joe’s routine is soon derailed when a seemingly straightforward rescue job of Senator Votto’s runaway daughter, Nina (Ekaterina Samsonov), unravels into something far more insidious. Ramsey plunges us headlong into the fragmented psyche of Joe, his mental state reflected in his dishevelled appearance of an unkept beard, greasy ponytail and bloated gut. Through Joe Bini’s superficially erratic editing we are privy to Joe’s recurring memories, or, perhaps more fittingly, traumas. These arresting images, that range from a child suffocating himself with a plastic bag to bodies piled high in a shipping container, give off the squalid stench of death. Ramsey induces these memories faithfully through visual triggers for Joe, his mother’s bare foot taking him back to the image of a boy, also barefoot, lying motionless in the desert, but also in moments of random calm as the mind churns through its subconscious archives. Much like the narrative, we never get a complete picture of Joe’s past, only suggestive fragments that point to an abusive father, military service and harrowing police work. Ramsey’s refusal to present the full picture allows us to indulge in Joe’s warped world and imaginatively fill in the gaps making for a far more ambiguous, enigmatic experience. The elliptical linearity of the editing only adds to the ghostly transience of Joe and the split past, present and futures encompassing him. Ramsey supplements these visual cues through Johnny Greenwood’s impacting soundscape. Greenwood, of Radiohead fame, supplants his deft classic compositions on Phantom Thread for an aggressive electronic cacophony alive with the nocturnal urban sprawl. Our subtle immersion with Joe extends to the audio landscape as the outside world becomes increasingly noisy, polluted and oppressive in contrast to the tranquillity of his domestic life, punctuated only by the affectionate radio duets of mother and son. Ramsey’s mastery of film as medium extends to her ability to create arresting, unique imagery. A particularly gruesome raid involving Joe and his trusty hammer resists gratuitous violence by presenting it through a cycle of CCTV cameras, creating a greater sense of brutality through its own stark detachment. Similarly, there are moments of pure inspiration and beauty littered in this world of violence. One of the film’s most searing scenes involves an aquatic encounter reminiscent of Night of the Hunter that’s spellbinding in its execution. The joy of Ramsey’s style is that it is impossible to telegraph. Nothing is certain, nor is it ever predictable. Once in its stride, You Were Never Really Here can jolt you out of your viewing comfort at any moment with unerring force. 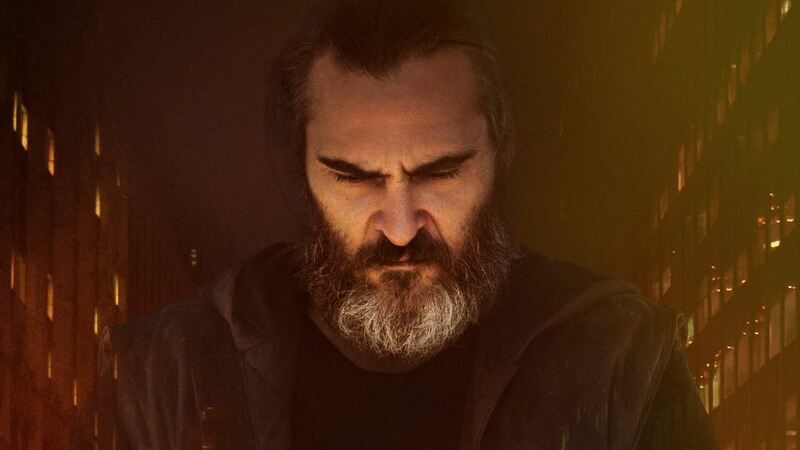 At the heart of You Were Never Really Here is the always brilliant Joaquin Phoenix providing a performance of psychological depth and physicality. Phoenix’s infamous intensity transposes seamlessly on to the damaged Joe, his piercing eyes opening a portal into a corroded, almost absent, soul. Having successfully embodied self-destructive personalities in Walk the Line and The Master, Phoenix makes his performance of the complex Joe appear effortless. Phoenix is one of the few contemporary actors capable of the versatility needed to shift between the extremes of Joe’s character, whether that’s unbridled emotional outpouring or quiet contemplation. Physical transformations always land the plaudits and Phoenix has plied on the pounds for his performance. His bulky physique, admirably closer to dad-bod than action hero, carries with it a certified presence necessary for offsetting Ramsey’s skeletal approach. Cinematographer Darius Khondji called Lynne Ramsey one of the greatest living filmmakers and based on You Were Never Really Here there is a certainly a compelling case for the accolade. Ramsey is pure cinema, totally in tune with how the fundamentals of the medium can be used to uniquely create a story and atmosphere. With Joaquin Phoenix, like Tilda Swinton in her previous film We Need to Talk About Kevin, Ramsey has an enigmatic and charismatic central totem that allows her to weave her visceral, methodical magic. An extension of New Hollywood’s character driven dramas, You Were Never Really Here is an immersive odyssey capable of redefining the parameters of not just thrillers, but narrative filmmaking as a whole. The greatest irony of You Were Never Really Here is that once you’ve seen it, the experience will smoulder long in the memory.